Aqua Marina Fusion Review: Is it the Best iSUP for You? Leave it to Aqua Marina to provide an affordable option to get you into paddling right away! There’s no need to go another Summer watching your friends paddle without you because you don’t have the cash. The Fusion iSUP is your ticket into wet and wild fun! If Spring Break means time out on the water, then you don’t want to be left a loner! The Fusion iSUP is so affordable, it’s nuts! The skin is a wild and funky orange with a black, honeycomb traction pad that will keep you standing in comfort and not falling off like a newbie. The double-wall drop stitch PVC construction will handle all the paddling you can dish out while cruising on the lake with your mates. No ever said you need a hard board to get paddling! Plus, you’ll save some extra cash with this buy and you won’t be eating Raamen noodles for the rest of the school semester! If the family is wanting to join in on the fun, the iSUP can maintain up to 308 pounds! Load up the kids, dog, and all! Don’t forget the snacks and drinks that can be tied down with the bungee cord set up. It’s well worth packing it on board if you plan on exploring and venturing out past the ocean break. With an awesome skin and a superb price for an all-inclusive package, what have you got to lose? 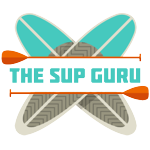 This is a beginner’s SUP into learning to cruise flat water and calm seas. However, more experienced SUPpers should be able to get a little more out of it in light surf. The 6 inch thickness and wide design makes it extremely stable on the lake, river, and ocean. Experts can check out this range of boards for something more suitable. 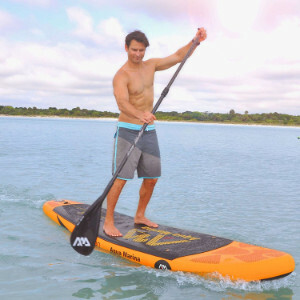 Users love the rigidity and stiffness this cheap SUP provides! For the price, most people wouldn’t expect it, but it proves to be stable, durable, and extremely functional. The iSUP itself is a hit with its buyers, it’s the accessories that don’t seem to impress too much. The adjustable paddle is on the short end of the stick for most adult paddlers. This is a downside since you might end up having to spend more for a better and longer paddle. Also, it seems to have issues with air leaks when trying to pump the iSUP or tears may be prone to occur. You might get pretty familiar with the patch kit during your course of ownership. But, for an iSUP that gets you on the water today, it’s worth the price while you save up for one three times the price! For conflicting information on the board, check out our FAQ below! Does the Aqua Marina come with 3 Fins? Many pictures featured online display three fins indicating the tri fin setup, however, this isn’t the case. The Fusion iSUP is a single fin setup, so it only comes with one fin. Does the Fusion iSUP come with a Paddle? Some buyers have received the iSUP with and without the paddle. 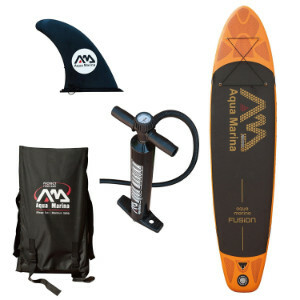 To be clear, the Aqua Marina Fusion iSUP does come with a paddle in the purchase. It’s a 3-piece adjustable aluminum paddle. If your purchase comes without a paddle, ensure you contact customer service right away and they’ll send you one. Can a SUP Seat be Attached to the Inflatable SUP board? Unfortunately, it’s going to be difficult to attach a kayak-like seat to the SUP unless you rig it. The only d-rings on board are towards the nose for on-deck storage. There are no d-rings close enough to the center to mount a seat. How Long does it take to Inflate the iSUP? It takes about 10 minutes to get it to full PSI of 15. If you’re accustomed to using upper arm strength, it might only take you five minutes. There are many users that say it’s 10’10” long, however the 130 inch length converts into 10’8″ in feet. It mightn’t be a huge deal, but it could be a deal breaker if you wanted that little bit of extra length. However, with 308 pounds of max weight, it’s really a non-issue. Is this a New iSUP for Aqua Marina? Yes! This is the newer version and the third generation model of the Aqua Marina SPK-3. Some buyers have had issues with valve leaks and staying air tight during pumping. This piece is covered under warranty and is replaceable. Does the iSUP come with a Pump or a Paddle? Some buyers weren’t sure if it comes with a pump or a paddle or both. To set the record straight, it comes with both. The iSUP should arrive with a paddle, pump with gauge, backpack, bungee cord, and center fin. The best comparable iSUP for an almost identical price is the Sportstuff 1030 Adventure iSUP. It’s 10’6″ x 30″ x 4″ and is ready for action! It comes with all the fixings including awesome freebies – a SUP seat with back rest and board leash! It has incredible value for the price and accessories, and mind you, a paddle that’s not just for kids! Make sure to drop by our iSUP reviews to see everything we have to say on the Adventure! If you’re determined to give Aqua Marina a chance, and you’re willing to spend not even $100 more, the Aqua Marina Monster iSUP is worth a once-over! The long 12′ monster with a very generous 32 inch width and 6 inch thickness is super stable for riders who want to brave choppy waters with speed made possible with its rockered nose design. But, if a much lower price tag is calling you stronger than ever, the Aqua Marina Vapor might be your only option. The only difference to the Fusion iSUP is it’s only 4 inches thick instead of 6. Not bad for an entry-level buy! To SUP (sum) it up, the Aqua Marina Fusion iSUP functions exactly as described and is perfect for the price. Granted, you’re not getting $1000 quality and performance for this few hundred dollar board, but for some light fun on a lazy day, you don’t need to spend a penny more!